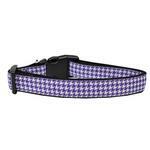 The Houndstooth Nylon Dog Collar in Purple will take your breath away! Bring a classic design staple with flair to your dogs wardrobe with the Houndstooth Nylon Dog Collar! This fashionable, durable Ribbon on 1" Nylon Webbing Collars from Mirage Pet Products are sure to make your pooch the talk of the neighborhood! Made of durable nylon with a high quality ribbon overlay. Collars have high-quality adjustable quick-release buckles to fit a variety of neck sizes. Made in the U.S.A. Medium: Width 1", Length 10-18"
Large: Width 1", Length 18-26"
Posted On 09/06/16 by Heidi M P from Burghill, OH Yes, Heidi M P recommends this product! This is a great pattern and great color for any dog, male or female. Posted On 04/11/16 by Heidi M P from Burghill, OH Yes, Heidi M P recommends this product! Love this collar! Great color, great construction, great deal! The quality of the products are wonderful. I did order several sizes but did get the correct fit on the third try. Return was very easy.